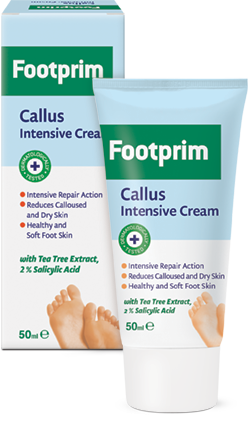 Anti-callus Intensive Cream Footprim effectively heals the calluses and reduces the rough skin. The Salicylic Acid enhances the exfoliation of the calloused upper layer of the skin, so that the callus can gradually diminish. The added glycerin softens the skin and enhances its faster recovery. The Tea Tree Extract has an antifungal action. After absorption, the cream does not leave greasy marks. For a short period of time the skin is renewed, soft, and healthy. Apply the cream twice a day on clean and dried skin in the area of the callus. Rub in until the complete absorption and wash your hands after the procedure.